How do you help a teen overcome their procrastination and take action on academic assignments they don’t want to do? In today’s episode Gretchen walks you through a checklist of four ways to help teens “get in gear” when they are procrastinating. 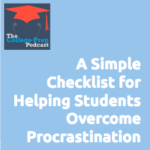 To go deeper with this checklist, or for more information about how to help students overcome procrastination, check out Gretchen’s upcoming course for educators The Art of Inspiring Students to Study Strategically. Click here to listen in as Gretchen walks you through a checklist of four ways to help teens “get in gear” when they are procrastinating.